ezmesh is not recommended. Use fmesh instead. ezmesh(fun) creates a graph of fun(x,y) using the mesh function. 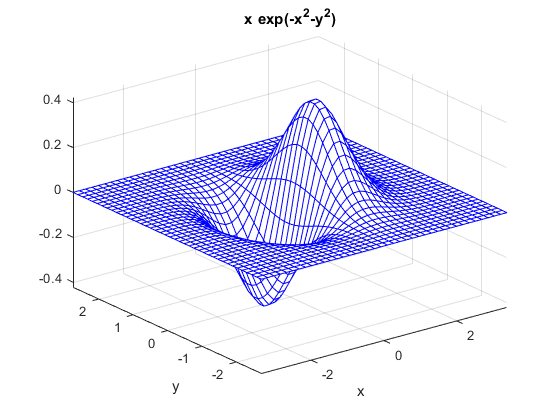 fun is plotted over the default domain: -2π < x < 2π, -2π < y < 2π. fun can be a function handle, a character vector, or a string (see the Tips section). ezmesh(fun,domain) plots fun over the specified domain. domain can be either a 4-by-1 vector [xmin, xmax, ymin, ymax] or a 2-by-1 vector [min, max] (where min < x < max, min < y < max). ezmesh(funx,funy,funz) plots the parametric surface funx(s,t), funy(s,t), and funz(s,t) over the square: -2π < s < 2π, -2π < t < 2π. ezmesh(funx,funy,funz,[smin,smax,tmin,tmax]) or ezmesh(funx,funy,funz,[min,max]) plots the parametric surface using the specified domain. ezmesh(...,n) plots fun over the default domain using an n-by-n grid. The default value for n is 60.
ezmesh(...,'circ') plots fun over a disk centered on the domain. ezmesh(axes_handle,...) plots into the axes with handle axes_handle instead of the current axes (gca). h = ezmesh(...) returns the handle to a surface object in h.
Create a mesh plot of the function f(x,y)=xe-x2-y2 over a 40-by-40 grid. Set the mesh lines to a uniform blue color by setting the colormap to a single color. That is, x^2 is interpreted as x.^2 in the character vector or string you pass to ezmesh. If the function to be plotted is a function of the variables u and v (rather than x and y), then the domain endpoints umin, umax, vmin, and vmax are sorted alphabetically. 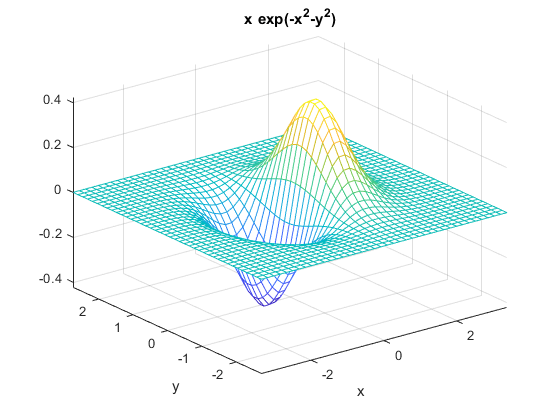 Thus, ezmesh('u^2 - v^3',[0,1],[3,6]) plots u2 - v3 over 0 < u < 1, 3 < v < 6. Function handle arguments must point to functions that use MATLAB syntax. For example, the following statements define an anonymous function and pass the function handle fh to ezmesh. Note that when using function handles, you must use the array power, array multiplication, and array division operators (.^, . *, ./) since ezmesh does not alter the syntax, as in the case with character vector or string inputs.